An unusual theme?for bridal showers is putting together the couple’s first “wine cellar” by?having guests?each contribute one bottle of wine or a wine accessory.? 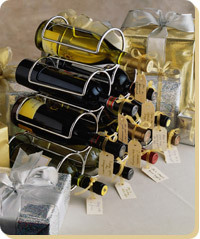 ?Each bottle of wine should?have a?tag or?note attached with a pretty ribbon?designating each bottle of wine?for a special occasion. Wine accessories could include a corkscrew, wine glasses, or an elegant decanter.? The menu for the bridal shower should follow the theme and be a wine and cheese party.